For the last 4,500 years before Gutenberg invented the printing press, humans had to use their hands to hand write books, sometimes humans used to write on the surface of clay, papyrus, wax and parchment. From researches the Chinese and Koreans had inventors who had been producing books before Gutenberg invented the printing press. The earliest printed book known as "Diamond Sutra" which was printed in China around 868 took lots of years to get it produced because the Chinese used wooden blocks and evenly separated characters, but Gutenberg came along and he made things easier. Johannes Gutenberg was born 1400 in Mainz, Germany and lived until the age of 68,and died in Mainz. As Gutenberg grew up, he loved reading and worked as a gold smith, a gem cutter and a metallurgist. But because of business problems and not gaining enough money he decided to look for a new job so that he could pay for his dept. Luckily in 1423 block printing was brought to Europe; Gutenberg became very interested with this method because it was much better than manuscript books. Because Johannes’s parents where rich, so there was not a problem for him to own books and manuscripts. As he got older he had a dream of making a faster way to publish books, so he went to Strasberg and stayed there around 1434-1444 and found an abandoned workshop to pursue his inventing dreams. Johannes Gutenberg tried printing but he failed many times in trying to build his machine, and while he was building the printing press, he tried to make the Bible with his machine but he was not making any progress. 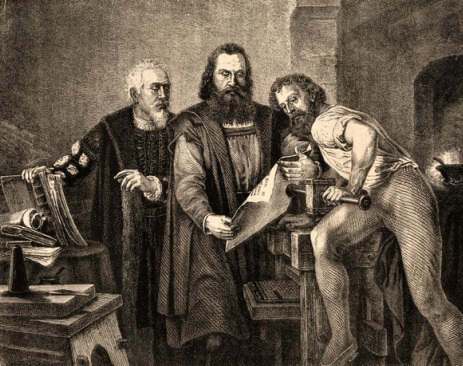 Johannes Gutenberg then decided to go to Mainz and there he started to try printing and establishing his workshop, but he needed more money to keep the workshop going. So Johannes decided to borrow 1600 guilders from Mr. Fust a rich man to help him keep his workshop running to invent machines and also make a cheap way of printing books. Johannes Gutenberg had used the technology that already existed to invent hand- mould for the cast type, the printing press and combination of characters which made printing faster comparing to the earlier times. During the process of making books, around 1452 -1455 Johannes printed 180 bibles (30 on parchment and 150 on paper). Each bible consisted of 1282 printed pages and usually with 42 lines, all the bibles were printed in Latin language and Copies of his books were sold across Northern Europe. Fust became good partners with Gutenberg at the workshop, but because he had realized that Johannes Gutenberg and his work partner Peter Schoeffer were becoming much more successful then he was. Fust then decided to take a different part to collect his money back from Gutenberg around 1455 and because of this their friendship had started to come apart. Johannes Gutenberg was not able to pay Fust so he had given all his machines, tools and also his employer Peter Schoeffer to Fust. 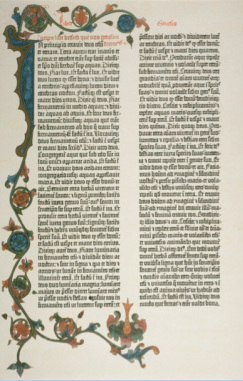 Fust became successful with printing while Gutenberg remained in Mainz and suffered poverty until he became blind and died in St. Victor’s parish in Mainz on February 3, 1468. Gutenberg’s invention created an impact on the world and new jobs like a compositor, a printer and a type caster. The inventions of Gutenberg’s books made education available for everyone and this lead to the invention of making computer printer. "Johann Gutenberg." Johann Gutenberg. N.p., n.d. Web. 29 Apr. 2013. 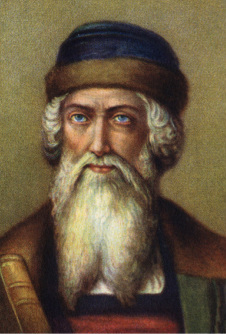 <http://www.middle-ages.org.uk/johann-gutenberg.htm>. "Inventor Johannes Gutenberg Biography." Inventor Johannes Gutenberg Biography. N.p., 26 Jan. 2006. Web. 29 Apr. 2013. <http://www.ideafinder.com/history/inventors/gutenberg.htm>. "Gutenberg's Bibles— Where to Find Them." Gutenberg's Bibles-- Where to Find Them. N.p., 2007. Web. 29 Apr. 2013. <http://www.flying-moose.com/article4.html>. "Harry Ransom CenterThe University of Texas at Austin." Harry Ransom Center RSS. N.p., n.d. Web. 02 May 2013. "Printed Books Existed Nearly 600 Years before Gutenberg's Bible." Io9. N.p., n.d. Web. 02 May 2013. Answers.com. Answers, n.d. Web. 02 May 2013.